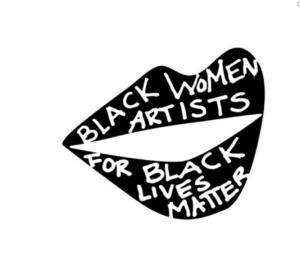 Shani performs with Black Women Artists for Black Lives Matter, a collective working in solidarity with the movement for Black lives. 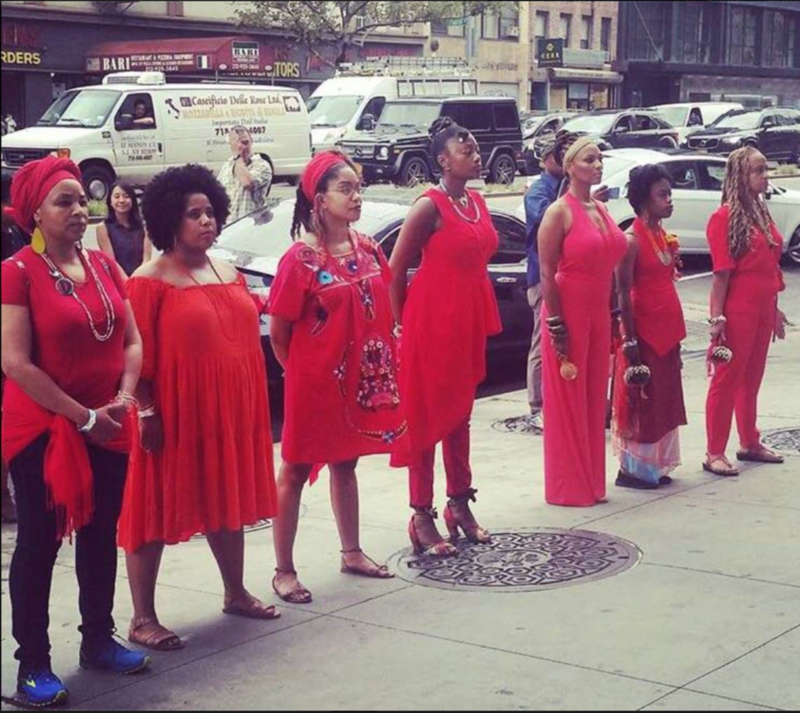 Simone Leigh convened this group while she was an artist in residence at the New Museum, in response to the continued inhumane institutionalized violence against black lives in the U.S.
For updates and information on BWA for BLM, please follow the group on Twitter (#BWAforBLM) and Instagram (@BWAforBLM). 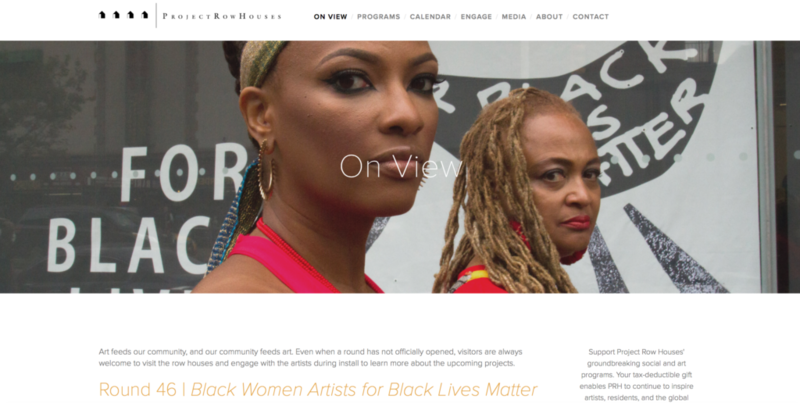 Most recently, BWA for BLM was included in a group exhibition “Vanishing Points” which opened on March 23rd at New York’s James Cohan Gallery, at Project Row Houses in Houston, TX from March 25th – June 4th, 2017, performed at the Brooklyn Museum on September 16th, 2017, and more. Elia Alba, Omololu Refilwe Babatunde, Firelei Báez, Chloë Bass, Suhaly Bautista-Carolina, Laylah Amatullah Barrayn, Aisha Tandiwe Bell, Joeonna Bellorado-Samuels, Michelle Bishop, Tokumbo Bodunde, Janice Bond, Alicia Boone-Jean-Noel, Charlotte Brathwaite, Sheila Pree Bright, LaKela Brown, Tracy Brown, Rashida Bumbray, Crystal Z. Campbell, Alexis Caputo, Tanisha Christie, Andrea Chung, Elvira Clayton, Pamela Council, Aimee Meredith Cox, Vivian Crockett, Una-Kariim A. Cross, Stephanie A. Cunningham, Tamara Davidson, Joy Davis, Sonia Louise Davis, Danielle Dean, Lisa Dent, Abigail Deville, LaTasha N. Nevada Diggs, DJ Tara, Abby Dobson, Kimberly Drew, Dominique Duroseau, Tara Duvivier, Minkie English, Nona Faustine, Catherine Feliz, Yance Ford, Carolyn Lieba Francois-Lazard, Tia-Simone Gardner, Ja’Tovia M. Gary, Ebony Noelle Golden, Kearra Amaya Gopee, Stephanie Graham, Adjua Gargi Nzinga Greaves, Kaitlyn Greenidge, Deana Haggag, Carrie Hawks, Robyn Hillman-Harrigan, Kenyatta A.C. Hinkle, Lehna Huie, Rujeko Hockley, Kemi Ilesanmi, Ariel Jackson, Tomashi Jackson, Ashley James, Shani Jamila, E. Jane, Fabiola Jean-Louis, Steffani Jemison, Jacqueline Johnson, Natasha Johnson, Ladi’Sasha Jones, Jay Katelansky, Daniella Rose King, Nsenga Knight, Ya La’Ford, Geraldine Leibot, Toya A. Lillard, Stephanie Lindquist, Simone Leigh, Jodie Lyn-Kee-Chow, Anina Major, Helen Marie, Brittany Marrow, Nomaduma Rosa Masilela, Tiona McClodden, Paloma McGregor, Glendalys Medina, Nina Angela Mercer, Helina Metaferia, Joiri Minaya, Jasmine Mitchell, Elissa Blount Moorhead, Nontsikelelo Mutiti, Shervone Neckles, Jennifer Harrison Newman, Mendi Obadike, Lorraine O’Grady, Adenike Olanrewaju, Sherley C. Olopherne, Jennifer Harrison Packer, Sondra Perry, Shani Peters, Julia Phillips, Ada Pinkston, Sharbreon Plummer, Mary Pryor, Kameelah Janan Rasheed, Amber Robles-Gordon, Shellyne Rodriguez, Karen Rose, Clarivel Ruiz, Annie Seaton, Karen Seneferu, Derica Shields, Alexandria Smith, Tiffany Smith, Mikhaile Solomon, Kara Springer, Mary A. Valverde, Sam Vernon, Shannon Wallace, Camille Wanliss, Anastasia Warren, Patrice Renee Washington, Fatimah White, Nafis White, Ayesha Williams, Saya Woolfalk, Lachell Workman, and Akeema-Zane.